Notice! Hotel Kervansaray Marmaris does not accept reservations at this time. Please try again later. 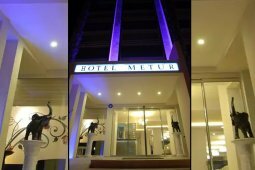 Hotel Kervansaray Marmaris Contact. Kervansaray Marmaris, which gives its guests all the beauty of nature in Armutalan ?, the charming town of Marmaris, transforms holiday pleasure into fun-filled experiences. Surrounded by pine forests, the resort offers a colorful holiday with its gentle service and comfortable rooms. There are many entertainment options available throughout the day, with a distance of 2.5 km from the center of Marmaris. Guests can enjoy pleasant moments in the spacious outdoor pool of the facility. Modern rooms in the facility; air conditioning, minibar and balcony. Hotel Kervansaray Marmaris accepts VISA and reserves the right to temporarily hold an amount prior to arrival. Hotel Kervansaray Marmaris accepts Master Card and reserves the right to temporarily hold an amount prior to arrival. Hotel Kervansaray Marmaris accepts Maestro and reserves the right to temporarily hold an amount prior to arrival. Hotel Kervansaray Marmaris accepts Bank card and reserves the right to temporarily hold an amount prior to arrival. Hotel Kervansaray Marmaris accepts ATM card and reserves the right to temporarily hold an amount prior to arrival. Breakfast, lunch and dinner buffet meals. Some local alcoholic and non-alcoholic drinks are free from 10:00 to 23:00. Some of the facilities that provide service throughout the year; Summer Concept between 01.04 - 31.10, Winter Concept is applied between 01.11 - 31.03. There may be differences in Summer and Winter concepts. You can get detailed concept information or information about toll-free services from our offices, catalogs or sales consultants. Internet usage is chargeable in all areas of the facility. Kervansaray entrance to Marmaris rooms starts at 14.00 hours. The departure time from the rooms is no later than 12.00. Tesise pet is not accepted. The use of open space that serves as a test is dependent on seasonal conditions. All-inclusive accommodation, including lunch, starts with lunch and includes dinner until the number of nights booked, and ends on the morning of departure with breakfast. Internet is available in all areas, it is fee. Facility pools can be entered with haşema. The facility was built in 1990 and restoration work was carried out in 2012. Cheers guys, had a great time. For the great price wasn't expecting anything and although not truly 4 star, your staff gave us a really great time and made sure we were always looked after, no matter what time it wasn't I would always recommend this place for a cheap as chips holiday, show the staff a smile and they'll make sure that you have as great a time as they can provode. Food may not be the best, but when ox tail, liver or ox tongue is served you're in for a cracker!!! This hotel is 4 star but the food is more 2 star, the food taste tasteless most of the time and the food is left uncovered for all the flies to eat at the buffet as well as you, the cocktail...well I should say what cocktails they seemed to only do vodka or rum with chasers, beer or beer with lemonade (shandy) and soft drink both fizzy and dilute. The gym isnt a gym but they do have an in house salon, spa and jewelry store. The staff on a whole are friendly but the bell boy who was clearly limited in English was the best help. The pools get craweded all day until it closes. Evening entertainment is worth staying up for. The cleaning staff cleaned our room daily with fresh towels and little toiletries (cotton buds, shower cap, shampoo) etc. The holiday Rep Muhammad unfortunately sold us excursions that wasn't suitable for small babies in pushchairs. Went all inclusive in October. Most staff were welcoming and friendly. Wide variety of good food served. Try the Eggy bread! It's insanly good. Fantastic accommodation although some embarrassing aspects. The food from breakfast to evening meals was ghastly, only comparable to that served on a Klingon spaceship, we ate out at an additional cost. The maintenance and upkeep of the pool and 'so called' fitness centre was shocking. The fitness centre was a scrap yard, the pool chemistry not confidence inspiring nor the respective pool area housekeeping. Staff though were friendly and helpful, but the chef needs help, I mean training and possibly some redirection in what your paying patrons want at meal times, this really did spoil the experience. Not happy, ruined by a lack of customer awareness. For the first night, there is room decoration, fruit basket and wine.